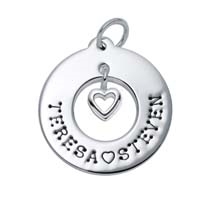 Adorned with our 3D cutout charms in Sterling Silver. Choose from a heart, star, flower, bone or fish. Windows Charms are not recommended for bracelets. Sterling Silver. Made in the USA.